A Journey of Hope by Grace Wulff is the story of Grace’s grandmother, of her first husband, and of her personal journey through grief and loss. It is available in print by clicking the ‘Purchase today’ link at the bottom of the page. It is now also available for purchase as a Kindle eBook on Amazon.ca. 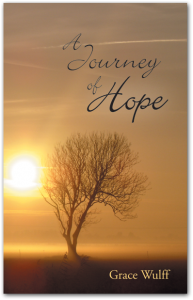 Click here to purchase the eBook version of A Journey of Hope on Amazon. This is a story of grief, but more than that, the overcoming of grief. Grace tells about her grandmother’s heart-wrenching grief at the loss of her young husband and child. It is also the story of Grace’s first husband, about his own horrific and unspoken grief at the tragic death of his parents when he was only fifteen. Grace goes on to share her own story of grief, and how she, as a young widow, found hope and learned from others who inspired her along the way. For Grace, hope and faith are synonymous. Her faith is central to her story. She also believes in the power of telling our stories. As we share our stories of courage and hope, we strengthen each other. So here is her story – a story of hope. It is her prayer that it will encourage all who read it.